Enter Copper Sky Plaza off of Cactus Rd we are the 2nd building on the left "8240"
Welcome to Oakeson Physical Therapy. We are a privately owned outpatient orthopedic clinic located in Peoria, Arizona. Our physical therapists have decades of combined experience. At Oakeson Physical Therapy, all facets of your treatment will be performed completely by a licensed physical therapist in our Peoria, Arizona location. We believe that this therapist-only environment provides each of our clients with the highest possible level of care. From your initial evaluation to your discharge, rest assured that your care will be in the best of hands. We aim to create a fun, relaxed environment while we work with you to achieve your goals. We welcome you to contact us with any questions. We look forward to assisting in returning you to optimum health. For any questions or to schedule an appointment, you may reach us at (623) 878-9696. 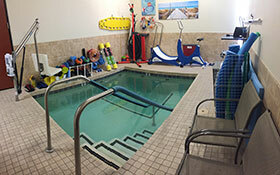 Our physical therapy practice has been serving the Valley for 25 years. We specialize in physical therapy for the communities of Glendale, Phoenix, Scottsdale, Peoria, and Tempe, Arizona.